READ TIME: 3 min., 5 sec. tl;dr: Finding, training, developing and retaining highly skilled IT workers has always been a major priority. But in recent years, the shortage of IT workers has forced IT leaders to rethink how they staff positions and train their teams. IT can continue to innovate in this area by seeking solutions designed to make existing teams more productive. Google “top concerns for IT” and the results might surprise you. CIOs are lying awake at night thinking about how to best monitor for new security threats according to this article in CIO magazine. Data protection, multi-cloud security, innovation and digital transformation, and finding new revenue streams rank high on the list as well. Departmental leaders, on the other hand, spend their alone time thinking about a different issue – people. Where will we find individuals skilled in our unique tool sets? How can we retrain and develop existing staff to learn new technology and take on more responsibility? Can we avoid bidding wars for people who have the skills we need? In the latest Emerging Risks Survey from Gartner, Inc., the talent shortage jumped from third to first place as the emerging risk for organizations worldwide. In fact, respondents to this survey said the talent shortage was more critical than "accelerating privacy regulation" and "cloud computing" — the top two risks in Q4 of 2018. Organizations simply can't find enough skilled talent to assist in cloud computing and data security monitoring, and that’s a major problem as they continue to migrate apps and resources to the cloud, fight to secure data, and monitor for hacks and threats to their networks. In another annual survey, IT outsourcer Harvey Nash and auditing firm KPMG asked more than 3,000 tech leaders for their input into the 2018 CIO Survey. Results show that 65% of respondents believe hiring challenges are holding their organizations back. This is a six-point increase compared to the 2017 CIO Survey. The talent shortage covers the tech space gamut – from a lack of people who know how to code, to a shortfall of cloud ops and data analytics experts. Not surprisingly, security and cloud computing are – once again – singled out as vital areas where IT organizations are increasing their budgets, including hiring more people to support cloud migration and data security. 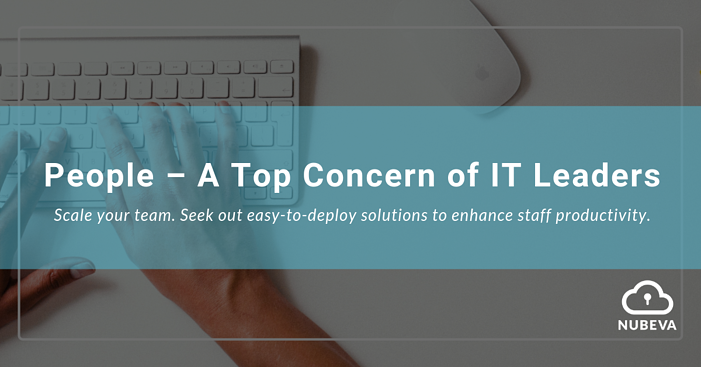 While there is no easy solve to the global IT staffing concerns that continues to grow, there are certain steps IT leaders can take to mitigate some of the difficulties in recruiting and hiring top talent. Shift your focus from a widespread, ineffective recruiting strategy to retraining existing staff. This tactic may require hiring candidates who don’t have all the desired skills and qualifications right now, but who have a hunger to learn and who can perform the job well with appropriate training. Tap the freelance talent marketplace. This might feel like a stop-gap measure, but 35% of the American workforce is already side-gigging, freelancing or temping. Filling voids with skilled DevOps, networking and monitoring specialists will allow you to get work done and manage to the IT staffing shortfall before it severely hinders you from achieving organizational goals and objectives. Unsure about hiring freelancers to do security work in your IT organization? Check out this article, which explains why you should set aside these concerns. Last but not least, update processes and internal expertise to make the most of existing tool investments. Integrate application performance monitoring, network monitoring and security monitoring processes with cloud workloads to help make existing staff more productive. One example of how to implement more efficient and effective solutions lies within your ability (or inability) to acquire, process and distribute cloud packets. Find the cloud version of your existing tools then send cloud workload packet data to those cloud instances. Your teams already understand the interface and the process flow of those tools so they will approach this new environment with a sense of confidence and speed. Your SecOps team will immediately discover time saved in spinning up and monitoring data – spending valuable time on true cloud network monitoring versus chasing every anomaly with nothing to show for their efforts at the end of the day. The IT staffing shortage is real and has no easy answer. But by slightly changing how IT manages it staffing concerns, the organization can still be effective, migrating resources to the cloud, monitoring data, ensuring security and planning for the future.